C1125. ARTUR RODZINSKI Cond. NYPO. 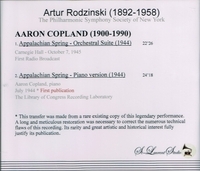 : Appalachian Spring (Orchestral Version) (first radio broadcast), 7 Oct., 1945); AARON COPLAND & LEO SMIT: Appalachian Spring (Piano Version) Library of Congress recording, 1944 (both Copland). (Canada) St Laurent Studio YSL 78-146, (from Rodzinski collection). Transfers by Yves St Laurent. "APPALACHIAN SPRING is a composition by Aaron Copland that premiered in 1944 and has achieved widespread and enduring popularity as an orchestral suite. The ballet, scored for a thirteen-member chamber orchestra, was created upon commission of choreographer and dancer Martha Graham with funds from the Coolidge Foundation; it premiered on Monday, 30 October, 1944, at the Library of Congress in Washington DC, with Martha Graham dancing the lead role. The set was designed by the Japanese American sculptor Isamu Noguchi. Copland was awarded the 1945 Pulitzer Prize for Music for his achievement. In 1945, Copland rearranged the ballet work as an orchestral suite, preserving most of the music. The ballet and orchestral work were well received. The latter was credited as more important in popularizing the composer. Music critics were in awe of Copland's ability to capture a vast emotional world within the limits of the 13-piece orchestration prescribed by the original score (which, in turn, was dictated by the size of the Coolidge Auditorium orchestra pit at the Library of Congress, site of the ballet's premiere). With some strings, a few woodwinds and piano he achieves remarkable effects. In letters to friends, the prolific 40-year-old composer expressed great satisfaction with the 'sonorities' of his score. Copland concludes the entire work with an ingenious return to the primal chords with which he starts. Prophetically, Copland's completion of APPALACHIAN SPRING was itself a new beginning."